VILNIUS, Lithuania (JTA) – It’s one of the most intriguing sites in all of Vilnius: a massive Soviet-style sports complex built in 1971 that since its closure in 2004 has become a run-down haven for vagrants. 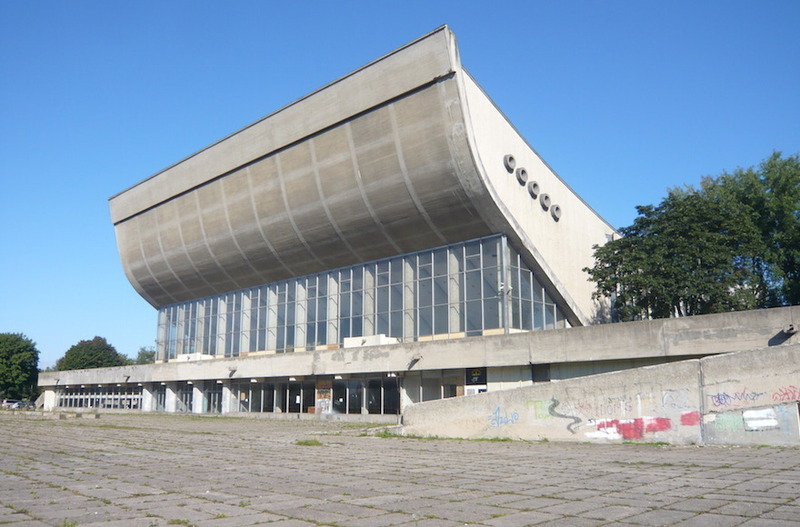 Now the Lithuanian government has some grand plans to renovate the rotting behemoth and turn it into a gleaming $25 million conference center. Just one thing stands in the way: a few dead Jews. Many local Jews oppose the planned construction; Jewish law forbids disturbing human remains. But when a group of rabbis from the London-based Committee for the Preservation of Jewish Cemeteries in Europe was flown in to assess the project, they gave it the thumbs-up in a meeting in April with Lithuanian Prime Minister Algirdas Butkevicius that was given prime-time news coverage. The reasoning of the committee, recognized as an expert body by the European Parliament, was that although the cemetery was located on the site, the proposed renovation would not disturb Jewish remains because remains may not even be present at the precise location of the planned construction. Lithuania’s official Jewish community leadership then followed suit and endorsed the government’s renovation plan for the hulking sports complex. Under the current plan, the area around the building would be preserved as a memorial park with plaques commemorating the prominent people buried there, according to Kukliansky. But some local Jews accuse both their leaders and the London-based rabbinic committee of corruption, charging that their decisions were the result of payoffs. They cite as evidence a 2009 cable sent by a U.S. State Department official and leaked by WikiLeaks that reported that the London-based committee was seeking $100,000 for “rabbinical supervision of digging,” to be obtained by the Lithuanian government from developers. The money was requested for supervision of exploratory digging and beautification of the Piramont compound conducted that year. But Ginsberg said the $100,000 was an estimate of the maximum amount of expenses that his organization would need to spend on the project, and that in the end the committee received only a few thousand dollars from the Lithuanian government. If not for the London committee’s intervention at Piramont, “the whole cemetery would have been leveled,” Ginsberg said. The fight over the Vilnius cemetery is among the more notable disputes surrounding the dilemma over how to deal with the crumbling Jewish graveyards of Eastern Europe. Jewish cemeteries all over the region are threatened – often by neglect, but also by real estate development. In Slovakia, the country’s small Jewish community can afford to care for and monitor only one-fifth of the country’s 750 cemeteries, which are easy targets for land grabs and abuse by contractors. In Poland, only 7 percent of 1,400 Jewish cemeteries are fenced, inviting garbage dumping and other mischief. As for the Piramont cemetery, Andrew Baker, the director of international affairs for the American Jewish Committee and the man who led negotiations with Lithuania’s government over restitution for Jewish property lost in the Holocaust, said the government’s handling of this particular issue has been praiseworthy. For its part, the government in Vilnius seems unfazed by the protest and is determined to carry out the renovation project.